Ascending triangle patterns are bullish formations that form during an uptrend as a continuation of the trend. There are some instances where an ascending triangle pattern could form a reversal pattern but they're typically continuation patterns. Watch our video below to learn how to locate ascending triangles on charts. When the bulls are in control, this pattern may be forming. Triangle patterns are important to be able to find in charts. Continuation patterns, such as the ascending triangle, are formed during strong trends. Read our post on how to read stock charts for beginners to learn more about the basics of reading charts. Two trend lines form this pattern. One trend line is horizontal while the other connects different price points as it heads up. The horizontal line has been a strong resistance level. Price can’t seem to break that line. Hence the ascending triangle patterns. Because it’s known as a continuation trend it generally forms during consolidation within an uptrend. Traders tend to get an entry when the price has broken the key resistance level. This then sends the price even higher. The reliability and strength of the ascending triangle depends on the pattern itself instead of the trend it’s in. You need 2 highs and 2 lows to form the trend lines for the pattern. But the more price touches the trend lines the more reliable trading it is. Waiting for confirmation with ascending triangle patterns keeps you from falling into a bull trap. Patterns can fake traders out. We trade in greed and fear so trapping traders can be a good way to take their money. Japanese candlesticks patterns were invented because of these situations. Candlesticks tell a story. Hammer candlesticks, gravestone doji candlesticks as well as dragonfly doji candlesticks can warn you of coming moves. Don’t get caught in a false breakout. A huge increase in volume can be confirmation the breakout has occurred. No one wants to leave money on the table but getting greedy can greatly increase your chances of falling for the trap. A false breakout on an ascending triangle pattern happens when the price falls significantly below the horizontal trend line, which is resistance, after the breakout. Then price remains lower. Trend lines are very important in triangle patterns. The price price breaks the heavy resistance trend line to break up for more bullish candlesticks along with some doji candlesticks. Volume is an important part of this pattern. Read our post on what does volume mean in stocks. We all have heard by now that patterns form within patterns. That’s why it’s so important to be able to find them. Ascending triangle patterns can take a few weeks up to a few months to form. In that time frame, there’s always more patterns forming inside the triangle. 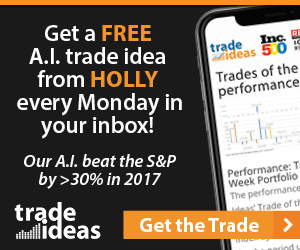 This allows you to trade in the interim, whether you’re trading options for a living or using swing trading techniques. The trend lines used to form the pattern also forms key levels of support and resistance. We typically think of support and resistance liens as horizontal lines. They can also take shape with the triangle patterns. The bottom line slopes up as support along the way. The horizontal top line forms resistance. It’s hard to break that resistance level. Once it does you can cash in on a nice continuation of the bullish trend. We teach how to trade ascending triangles on our live daily streams. Check out our trading service to learn more. This ascending triangle pattern took a few months to set up. Other patterns formed during that time that you could trade. Trend lines are used to form triangle points. The trend has to exist already for this to be considered a continuation trend. Which it usually is. It doesn’t really matter how long it takes ascending triangle patterns to form. What’s most important is how strong the formation is. You need at least 2 highs to form the top horizontal trend line coupled with a reaction low sandwiched between them. The highs don’t have to be exact but should be close in price. The bottom trend line needs at least 2 lows to form the lower trend line. The lows need to be be higher than the last as it moves up because the line isn’t straight across but moves at an angle. There needs to be distance between the lows. You can’t have them close together. If the most recent low is the same or lower than the previous low, the ascending triangle isn’t valid. That’s why we stress that patterns can break down. Things such as news can change the trend and direction of a stock. Ascending triangle patterns continue a trend in place. Waiting for confirmation is a smart move since you can get caught in a fake out. It takes time studying and practicing these patterns to get conformable trading them. If you’re willing to put in the time, you’ll become a great trader.